We’ve completed our trip to Hebron; it’s been quite an adventure. Let’s start with the Life Center itself. I’m happy to tell you the Life Center is alive and well. There’s a creche (child care center) here, and a family lives there so the building is occupied most of the week. 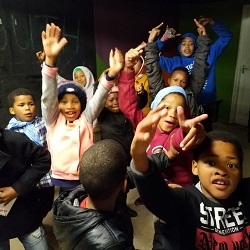 After school programs provide the children and youth of the area a place to go at least twice a week, and on breaks in the school year, such as this Youth Week, the building can accommodate 200+ young people and adults. When one thinks about it, it’s pretty remarkable that this building is here in this high valley above the city of Citrusdal. This is farm land, and it is productive. Orange groves, tea fields, flower farms and sheep ranches line the one paved road that runs down the center of the valley. The look of the place is much like that of Arizona, rocky crags in an arid landscape, but there is sufficient rain to grow. The past two years or so, the Western Cape has struggled with drought, but during our stay, we’ve experienced two significant and much needed rainstorms. The farmers are happy. Why dedicate land that could otherwise be cultivated to a community center? I can only assume that many of the farmers in the valley thought that same thing when the Hall family decided the farmworkers of the area needed someplace where they could gather, share their lives and worship. I don’t know the full back story on this, suffice to say that their vision of place that could build a life together reflects God’s love for this community. Youth Week began bright and early Monday morning. Trucks of excited, smiling kids arrived around 8:45 spilled out onto the fields. Kids were registered, given a name band, and assigned to a team that reflected their school grade. Red and Blue bandanas to the youngest, first – third graders, Green to the fourth and fifth, purples, sixth. Each farm has assigned a leader to their children, so there are many eyes on the kids in addition to our own. Some older high schoolers have also volunteered to watch over the kids, but it’s clear that thosee guys and girls are watching each other as much as they are watching the children. After registration, the kids are on the soccer pitch to play. There’s not too much soccer happening, mostly kick ball, rugby, jump rope races and dance competitions at one time or another, or all at once. In a short while, the kids are called back inside by Youth Week’s Leaders, Kinetic IV, a trio from Cape Town. The kids know them – they have led events at the Life Center in the past. The Trio commands their attention. One of them shouts out, “Attention,” and they line up in their groups as requested and are led through VBS-like songs, followed by the Monkey Dance, a 3-minute, super high energy cardio routine that left me soaked. Excess energy burned off, it’s time to assemble in groups to learn the day’s lesson (Monday’s theme is “Better Together”) and a bible story. Then, it’s time for snacks and about 15 minutes on the soccer pitch. When the groups return from outside, they are asked to assign themselves to a team that will perform for parents on Friday evening. There’s a Dance Team, Singing Team and a Rap Team, and Kinetic IV leads them through their assigned activity. After an hour of learning the moves, the songs or the how to rap, it’s time for lunch and play time outside. Balls get kicked over the fences they shouldn’t go over, older guys dodge and and weave their way through crowds of little kids, tossing a rugby ball from one end of the field to the other. Kick ball games start up, or kids just hang out with each other. Surprisingly, there’s very little shoving and pushing for this many children. They’ve learned the rules. Back in the building at one-ish, it’s time for a craft hour – we make paper loop chains, colored pictures, decorated picture frames for a group picture, etc. Suddenly, it’s two and the day is over as kids are picked up by the farm workers and returned home. This generally takes place over the hour between 2 and 3, and by 3:15, most of the children are gone for the day. For those who were here two years ago, this will not sound like the same camp. The kids are remarkably well-behaved. It’s a testament to the work of Karlin, HCPs Program Director, who has worked with the farmers and the children to establish firm boundaries on their behavior, and expectations on when the children can be dropped off in the beginning of the day, and at the end of the day. Also, the loving control Kinetic IV has over these kids. They really listen to these young leaders.